I vividly remember this discussion that happened in Consumer Behavior class 9 years ago. The session was on diffusion of innovation and our Professor was giving an example of how Kelloggs failed to launch their brand of cereals in India in the 1970s. The test sample couldn’t relate to the breakfast cereal concept. Since they were used to the habit of eating fresh, hot preparations for breakfast, they couldn’t bring themselves to eat a bowl of cereal with cold milk. It failed to meet their “fresh” expectations. They strongly believed in their prevailing food culture and eating habits. When we were kids, if our mom/grandmom makes idli/dosa for breakfast almost every single day, we would crib, “ennamma, daily idli dosai yaa?”. But the present generation kids are content with having a bowl of chocos with milk every single day. If at all they want a change, it is either bread toast with jam or pancakes with sugar-laden syrups. Is it because they are a happy, content lot? Not really. They have been systematically trained to get addicted to these sugary cereals. They are not exposed to the fresh, Indian way of breakfasts. One of my favorite topics to read and research is “behavior change”. Most literature emphasizes the fact that behavior change is hard. If that’s the case, how did Kelloggs manage to reenter the market, create a product category and make it a mandatory purchase in the weekly shopping list of urban Indians with high spending power? Exposure through global television made 90s kids become aware of breakfast cereals. By positioning it as “cool” and creating an aspirational image, youngsters were ready to try out this concept of breakfast cereal. Brands like Kelloggs have broken the initial “mindset” barrier through a barrage of TV advertisements. Most of the kids-focused cereals are loaded with sugar. Research has already proven how sugar is an addictive substance. The taste buds of kids love sugary foods by default. And these cereals are taking advantage of this fact and keeping the consumers hooked onto their brand. Schools start quite early these days and there’s no time to prepare fresh food. Even if the moms wake up early to cook fresh breakfast, the kids need to be interested in eating, which is a tough ask. Given the hectic lifestyles that urban Indians lead, the brands need to hardly do much to promote these ready-to-eat breakfast cereals. As this report states, “the market is self-propelled”. Most of the marketing messages of the breakfast cereal brands ensure that the audience could relate to their existing Indian eating habits. Kellogg’s comparison of chocos with roti - “roti jaise guno” is to make people believe that a bowl of chocos is equal to 2 rotis. Similar comparisons were also used to promote variations with almonds, honey etc. Our grandmas used to advise “roz badam khaalo”. And now these brands advocate the same advice through almond enriched cereals. The same 70s generation that rejected breakfast cereals have now switched to eating oats on a daily basis. They still prefer to eat “hot” breakfast. Their behavior hasn’t changed but the numerous health issues and convenience factor have motivated them to switch to oats. To cater to their “Indian” taste buds, brands have various masala flavored options. There is hardly anyone interested to know what is added in these masala varieties. According to India Breakfast Cereal Market Overview, India's breakfast cereal market was growing with an annual growth rate of 22.07% over last five years. 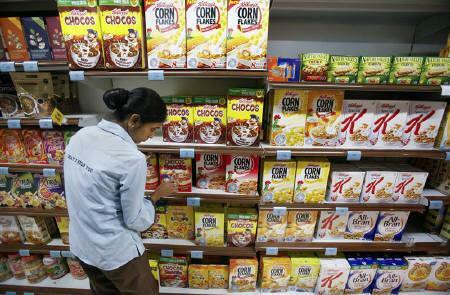 Kellogg's India, Bagrry and PepsiCo Quaker are the three leading companies capturing more than 75% of the market. Does these stats sound surprising to you? The alluring promise of “convenience” has made us lose our innate quality of “inquisitiveness”. We also need to blame our education system that shut our mouths in our early childhood days when we asked tough questions. - What does “flaking” process involve? - How does a corn become a “flake”? - Where are these corns sourced from? Are these GMO or non-GMO? - What is the processing mechanism? - What are the steps involved to ensure the flakes are dry? - How is it being preserved for months together? - What are the other ingredients added? - How are “fortified” vitamins being added? - Are such “fortified” vitamins being absorbed by our body? If so, to what extent? While I completely agree with your point, I see the same pattern in my house. Though I prepare fresh breakfast everyday, my daughter who leaves early for school is not ready to eat any heavy breakfast. So ultimately I pack it as snacks for her (which she eats at 9-9:30am). Just to make sure she is not hungry till the break, I am forced to give something light which is when the cornflakes comes in handy. I think the primary market of cornflakes lies there with those kids who leave early to school. I remember till last year we hardly used to give her cornflakes when she used to leave a bit late to school. One way to counter this would be by making schools provide healthy breakfast to children once they reach school. Just my thoughts. I totally understand. Just a thought - how about a small bowl of fruits or a handful of dry fruits, before your daughter leaves for school? That way, she wouldn't be hungry before her break at 9AM.